This smells great, and I haven’t even put anything in the bread machine yet. This Greek bread, also known as stafidopsomo, is made using currants, orange juice, cinnamon, cloves, honey, allspice and orange-blossom water. The first step I completed, the one that currently smells so great is to place 1 1/4 cups currants in a bowl with 1 stick of cinnamon, 2 whole cloves, a pinch of allspice and 3 tablespoons of orange juice. This is covered and allowed to stand at room temperature for an hour while the currants get soft and plump. After the hour is up, I removed the cinnamon stick and cloves. I then drained the currants and set them aside, reserving the remaining OJ. To the juice, I added just a little water to equal 2 tablespoons. Into the bread machine pan went the OJ/water blend, 1 cup of evaporated milk, 1 1/2 teaspoons of orange-blossom water, 3 tablespoons honey, 1 1/2 teaspoons salt, 3 cups bread flour, 1 tablespoon gluten and 2 teaspoons of SAF yeast. The recipe does mention that while the orange-blossom water is a nice touch, it is optional and can be left out without affecting the bread. I have some orange-blossom water on hand, otherwise I might have left it out myself. It is not always an easy ingredient to find. This loaf uses the medium crust and sweet bread settings on my machine. 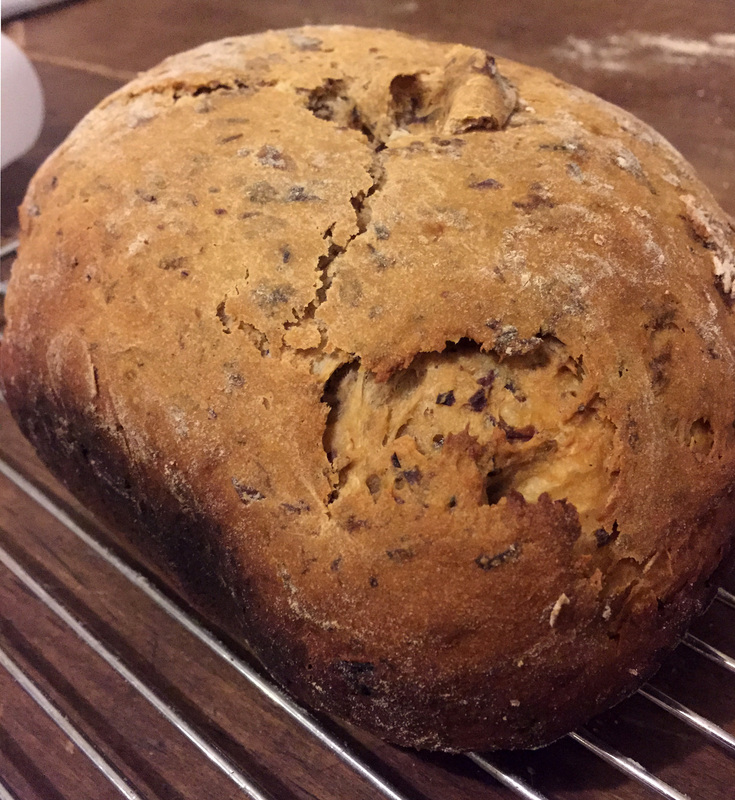 After the beep between the first and second Kneads, I added the drained currants. Here is where I got to hovering a bit. I used a rubber spatula to help incorporate the currants into the dough. I am not sure this was at all necessary, I just thought it couldn’t hurt. As I wait for the bread, I think I will make myself a cup of tea and use the cinnamon stick from the orange juice soak to flavor it. I hate the thought of wasting a cinnamon stick but I don’t know if there is a way to salvage and store it after having been soaked in juice. Ah well, this will certainly be a good cup of tea. Uh oh, this loaf really has me worried. It doesn’t seem to be rising well, at all. It is reminding me of the Chocolate Pistachio loaf I did that never progressed beyond dough. In an attempt to salvage it, I stopped the machine after the last rise, but before it started baking. I then let the dough rise another hour (I checked it after 30 minutes, then decided to let it keep going.) It rose a bit. It at least has a nice rounded top now. I then turned the machine back on to just the bake cycle. Crossing my fingers now. Yeah, so apparently crossing fingers doesn’t actually DO anything. I have the Ben Folds Five song stuck on a loop in my head right now, “She’s a brick and I’m drowning, slowly.” Ah well. I will still take this one with me when I head out tomorrow, maybe I can salvage a slice from the o uter edge for one of my guinea pigs family members to taste. You know what? Mom and I went ahead and tried a slice of this this morning. It isn’t doughy, just a very heavy, very dense loaf of bread. I fried us each a slice in a little bit of butter, it was delicious. The flavors from the orange/currant/spice blend was great. Mom said it reminded her of a Pannetone. All in all, not a total fail. I still don’t like the sheer weight of it, and it may be more doughy at the center of the loaf, but the flavor is really nice.